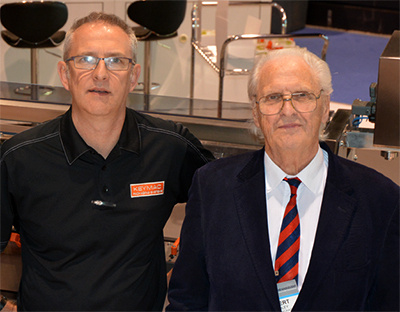 Keymac Packaging Systems, also known as Keymac was founded in Keynsham, United Kingdom in 2005 by Mike Bradley and his father, Albert Bradley. Based on its humble beginnings in the town of Keynsham the Name ‘Keymac’ is derived from ’Keynsham Machinery’. Keymac still manufactures machines in Keynsham today. Keymac developed its first automated machine — the K101 Autosleeve with its small foot print, and unique operation offering a purpose built solution that had not been previously available. Through this development concept, Keymac has gone from strength to strength, continually manufacturing and supplying clients all over the world. It is still expanding today with its unrivaled range of machinery. In 2010 Keymac opened it’s new manufacturing facility in Charlotte, NC expanding the range to new markets in North and South America. This led to the further development of the range to meet higher speeds and include many new machines handling unique concepts in packaging that have not been automated before. To meet the ever expanding and changing consumer market demands, Keymac has developed a comprehensive range of machinery that have become industry standards. This machine range provides solutions from simple innovative concepts to high tech robotics. We also assess your specific packaging requirements and apply a creative yet practical approach that results in increased business productivity. Michael founded Keymac Systems in England in 2005 and then opened in 2010, the Charlotte, North Carolina, manufacturing facility in the USA. He continues to expand and develop both locations in markets around the world. Michael began his career as an engineer with Bradman-Lake developing the standard carton machines which are supplied today. He later co-owned Adco Manufacturing Ltd. and developed many of the new machines in the Adco range. Albert started his career at age sixteen in the packaging industry with the Dickinson Robinson Group (DRG). In 1969 he set up his own company, Bradman-Lake. With this company he patented concepts and systems that have changed and influenced the packaging industry worldwide as the standard today. After selling his interests in Bradman-Lake, Albert and Michael started Keymac.